Here's my clean and simple card for the Less is More Challenge - it's a Lucky Dip week where the theme is to use SCALLOPS. I've silver embossed a small section of the Clematis Tower stamp (Oak House Studio) and coloured this with some Pental Metallic Markers to give it a little shine. 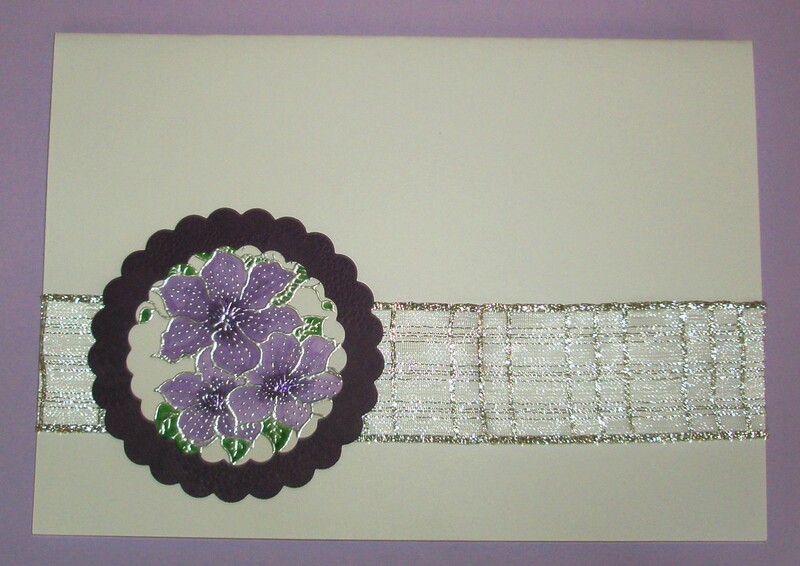 I then used my scallop dies to cut out the flower and a darker purple mat and just fastened them on the card with some silver mesh. Decided to stay in today and keep out of the cold so I've been crafting, cooking dinner and watching the Touring Car championship. Whatever you've been doing, stay warm and enjoy your Easter!! Great CAS card, love the embossed cematis flowers and the added mesh. Lovely colour Elaine and the shine looks super! So pretty and sparkly... zoomed in to admire it even more. So royal. What a great shine you got on your card....and it photographed so well! Beautifull done!